Camping. What does this conjure up? Happy holidays spent doing hearty activities with only a thin strip of canvas between you and twinkling celestial bodies? Miserable days spent perpetually damp, sleeping on an airbed that deflated nightly, and cooking a daily struggle? Or how about camping for softies? 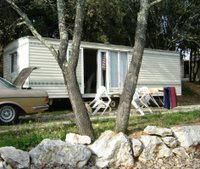 A cosy mobile home with shower, hot water, toilet and fridge, and best of all, a huge window through which to observe your fellow campers. Oh bliss! Childless, this Easter weekend had to be relaxing, quiet and comfortable. 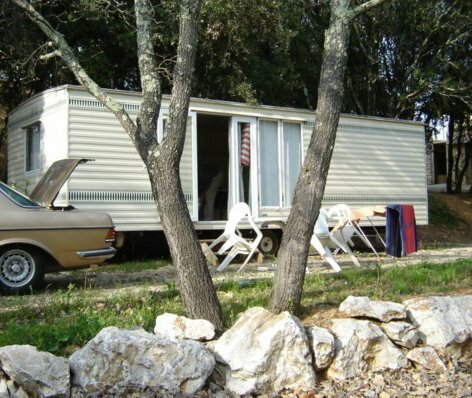 Having rummaged on the internet, the most attractive solution presented itself at the Camping les Cascades at La Roque-sur-Ceze renting this super snug mobile home for 90Euros. 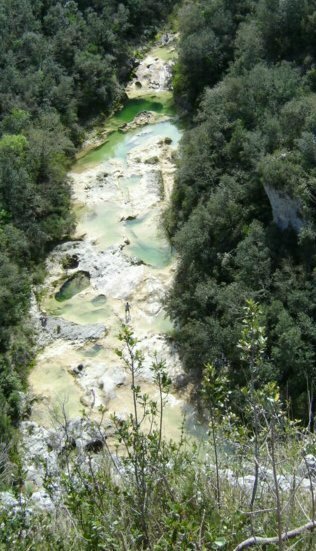 It took just an hour and a half to wend our way up, through Uzes which was bursting at the seams with visitors, and up into the Ardeche region west of Bagnols-sur-Ceze. 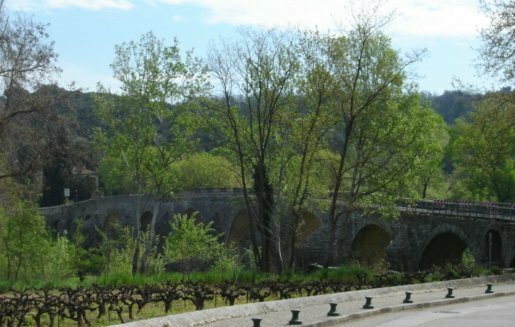 The village of La Roque-sur-Ceze is classed as an historic site, having sat prettily on the side of a hill since the Middle Ages. To cross the river you have traverse a dramatic-looking single-lane bridge, the barriers of which have fallen off, and have yet to be repaired. 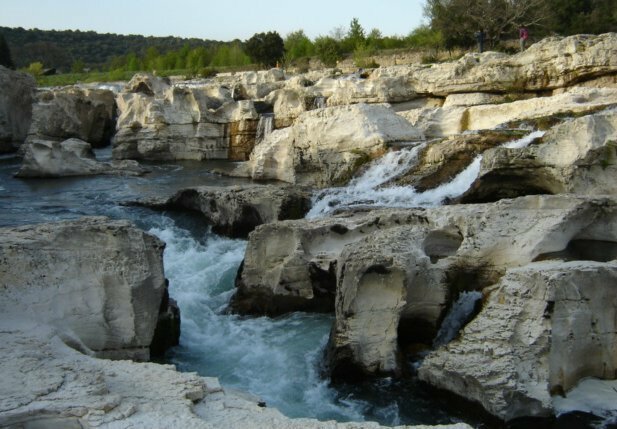 Downstream are the Cascades de Sautadet which give the campsite its name as it is located on its banks. They are stupendous. 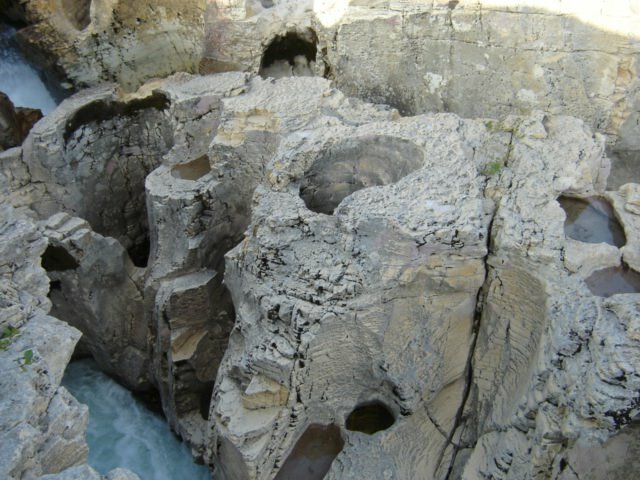 I have to admit I am rather a fan of natural sites of particular interest. 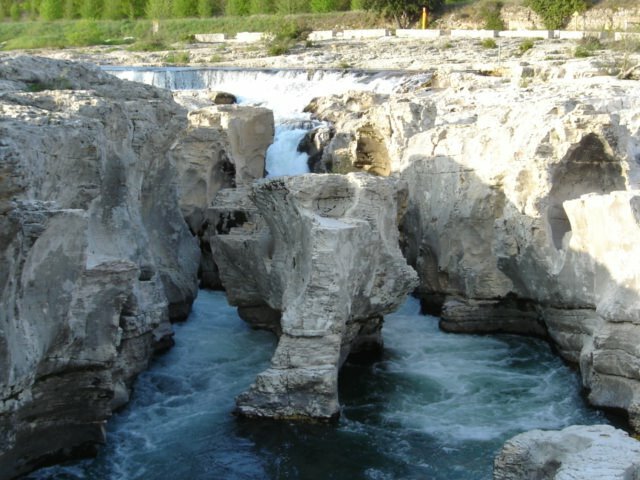 The cascades roar through boulders of limestone worn into fantastic shapes by the pounding of the water. You can walk along the banks marvelling at the terrifying swirling of the water where it is absolutely forbidden to swim for obvious reasons. It makes for a good stroll in the early evening as the shadows lengthen making the tortured shapes more sinister and threatening. Back at the campsite, however, with a refreshing gin&tonic, one could observe with voyeuristic pleasure the comings and goings of people with very small tents thus obliged to carry on their everyday activities under the watchful of eye of anyone who happened to be watching. One guy, for example, wandered passed clutching a bagged-up tent looking for the ideal spot. He found one just far enough away so we could watch him discreetly, but not so far that we had to dig out the binoculars. We thus were able to sip our aperitif to the pleasurable sight of a man at work. It was a mightily small tent, though. It looked like it might have belonged to one of his kids and I wonder even now whether he was able to lie full length in it. What was odd was that he later went to fetch his car, so could have carried a more opulently-sized tent with no trouble at all. Easter Sunday arose with glorious sunshine, a baguette delivered to our door, and a breakfast of fresh bread, jam and tea, all whilst admiring absolutely nothing except trees and grass in front of our generously proportioned window. We just about made it out in time for coffee at the shadey 'place' de Goudargues which was having an Easter market. Lots of flowers, herbs, spices, olive wood, wine, pottery, knick knacks and hunky cyclists returning from a rally. Refreshed with an adequate amount of caffeine, our thoughts turned to lunch, and we found a nice table by some water and idled away 3 hours eating and waiting to eat. An extended family at the next table gave up halfway through and stalked off just as the main course arrived. We then exchanged happy comments with our other neighbours about how pleasant it was not having kids around to hurry you up and that, being on holiday, we had all the time in the world to do nothing except eat and drink. We left the town via a quick visit to the communal laverie. Running water from the source ensured that clothes could be washed and rinsed in clean water. Back-breaking work, however. For slaves only, I would imagine. 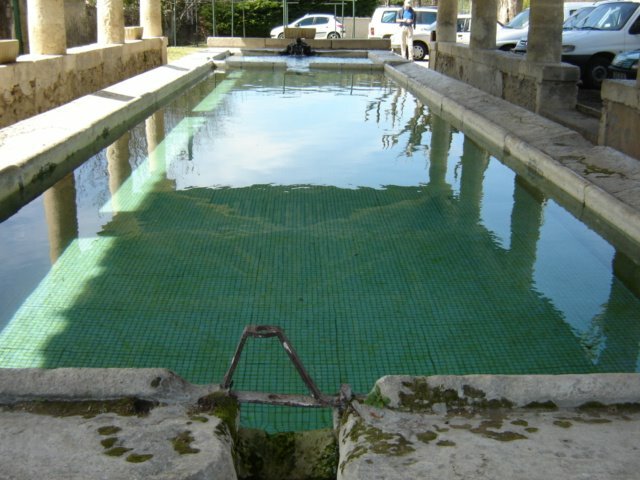 The town dates back to Roman times and is a refreshing spot to take refuge from the heat of the day. We had been advised by the campsite owner (whose name I didn't catch) to visit the Concluses near the village of Verfeuil. Another site of spectacular beauty, you drive up to it along wooded lanes, seemingly heading into the back of beyond. Then, you come to the carpark which is full. Lots of other people find the back of beyond too, which is an amazing discovery. There you were, thinking you were having an adventure, when all along you were trundling well-worn tracks with crowds of hearty types, OAPs, families with small kids, and anyone else you care to imagine. 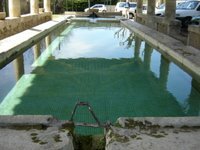 It's best to go at this time of year when there is ample water to admire the pools of inviting, translucent water. Later, the pools dry up and you can only stare in wonder at the natural dugouts worked into the limestone by thousands of years of water erosion. We did not venture down into the gorge. Time was getting on, we needed tea, and I wished to work on my book, as promised... Next time, though! Comfortably ensconced outside the mobile home, I was able to work, followed by observation of a group of 3 cyclists - two women and a man - put up one tent. Much speculation as to their relationships was made over G&T, and the idea that they could team up with Mr MiniTent to tidy up the numbers. The next morning they rummaged endlessly in their bike paniers, having rummaged extensively the previous evening. That's all they seemed to do, actually, although the rummaging did eventually pay off and they packed up and headed off for another day's exhausting effort. It's a very hilly place! 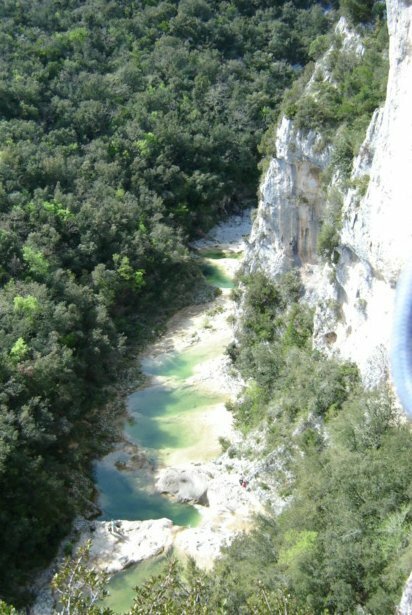 Our last day was spent meandering along the Gorges de l'Ardeche and agreeing that it was only worth really seeing from a canoe, and then back to reality, disgorging bags, a cross cat and the inevitable wait for returning boys. The problem people on campsites are those with caravans or big tents who have chairs, tables and lights, and so often talk outside half the night keeping others awake: for those travelling light go to bed after dinner. I too use a very small tent and sometimes travel with it by car, althought it comes into its own when walking or cycling. Small tents tend to be better in thunderstorms and high winds and are quicker to erect and stike, and for some styles of camping have no disadvantage other than making it hard to put on your trowsers in the morning. My style of camping uses the campsite for sleeping only. At dawn, after a shower I go to a cafe for breakfast, and return only after dinner. I would entirely agree that people have to be discreet and respect other's desires for peace in the evening. Most campsites I've been to insist on an 11pm cutoff for noise, so if campers want to continue carousing they have to do it from inside their tent/caravan/mobile home, and not to be a nuisance.